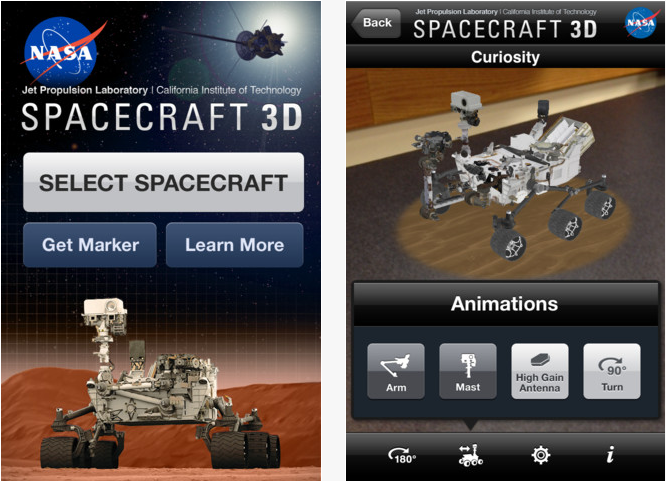 Spacecraft 3D is among the first of what are known as augmented-reality apps for Apple devices. Augmented-reality provides users a view of a real-world environment where elements are improved by additional input. Spacecraft 3D uses the iPhone or iPad camera to overlay information on the device’s main screen. The app instructs users to print an augmented reality target on a standard sheet of paper. When the device’s camera is pointed at the target, the spacecraft chosen by the user materializes on screen. Spacecraft 3D also has a feature where you can take your own augmented-reality picture of the rover or GRAIL spacecraft. You can even make a self-portrait with a spacecraft, putting yourself or someone else in the picture. Spacecraft 3D currently is only available for Apple formats, but should be available on other formats in the near future. The detailed computer models of the spacecraft used in Spacecraft 3D originally were generated for NASA’s “Eyes on the Solar System” web application. Eyes on the Solar System” is a 3-D environment full of NASA mission data that allows anyone to explore the cosmos from their computer.